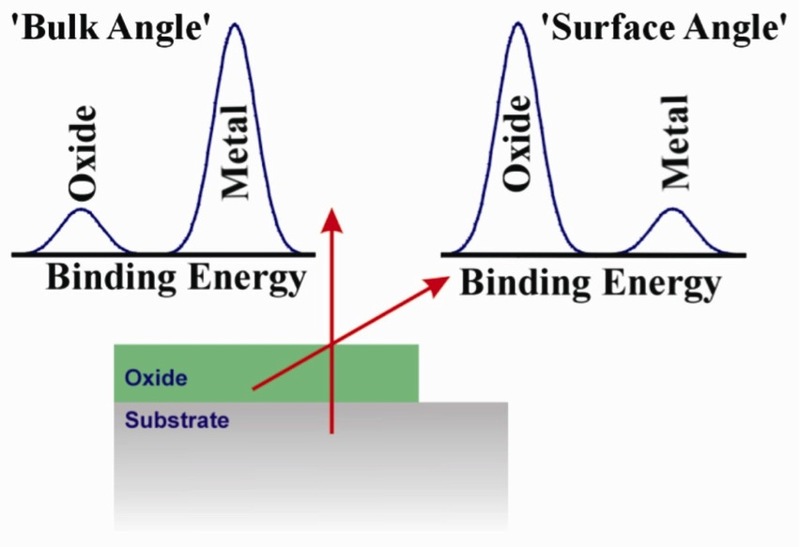 Analysis of a thin oxide film on a metal at near-normal and near-grazing collection angles could produce spectra with a larger relative intensity of the oxide peak at the near-grazing emission angle. The information depth for XPS is a few nanometers, depending upon the kinetic energy of the electrons and the material being analyzed. Angle-resolved XPS (ARXPS), however, is a technique that varies the emission angle at which the electrons are collected, thereby enabling electron detection from different depths. ARXPS provides information about the thickness and composition of ultra-thin films. Such measurements are non-destructive, unlike sputter profiling. It can be applied to films that are too thin to be analyzed by conventional depth profiling techniques. It can be applied to films that are irretrievably damaged by sputtering (e.g., polymers). It is non-destructive and can provide chemical state information, unlike methods based upon sputtering. Ordering of layers in an ultra-thin film. Distribution of elements and chemical states within the film (depth profile reconstruction). Angle-resolved XPS data is collected using a series of sample tilt angles. Conventional ARXPS experiments are undertaken in a serial manner, by limiting the angular acceptance of the analyser and stepping through a range of angles in turn. This is usually undertaken by tilting the sample with respect to the analyser. The arrangement of the Thermo Scientific Theta Probe, which can collect angle-resolved spectra in parallel. In contrast, the Thermo Scientific Theta Probe produces ARXPS spectra without tilting the sample. The Theta Probe is capable of parallel collection of angle-resolved data. The arrangement of the monochromator, lens, analyzer and detector enable this instrument to collect XPS data over a range of 60° with an angular resolution of approximately 1°. The use of a 2D detector results in electron dispersal according to their kinetic energy in one direction. In the other direction, electrons are dispersed according to the angle at which they were emitted from the sample. Parallel data collection is faster. 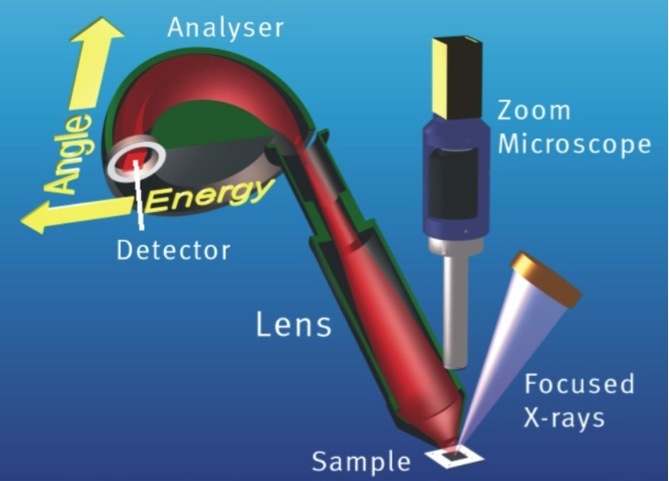 Parallel ARXPS enables measurements from large specimens, such as complete semiconductor wafers - such samples are too large to be tilted inside an XPS spectrometer. The sample does not move during parallel collection so the analysis position remains constant. When combining small-area XPS (SAXPS) and ARXPS, ensuring that the analysis point remains fixed during the experiment is difficult, especially if that point is remote from the tilt axis, even when using a eucentric stage. The analysis area remains constant during analysis. If lens-defined SAXPS is combined with ARXPS then the analysis area would increase by a large factor as the sample is tilted away from its normal position. Using a combination of source-defined SAXPS and parallel collection, the analysis area is angle-independent.